Because of the way Lucasfilm and Disney have planned out Star Wars films, we are going to be getting a new one every year for the foreseeable future. On the odd years, we’ll be getting saga films, and on the even years, there will be the Star Wars Story movies. And the person guiding it all is Lucasfilm president Kathleen Kennedy, who has been running the production company since it was acquired by Disney back in 2012. Basically, she’s the person to go to if you want to know anything regarding the new films – of course, that all depends on if you can get an answer out of her. 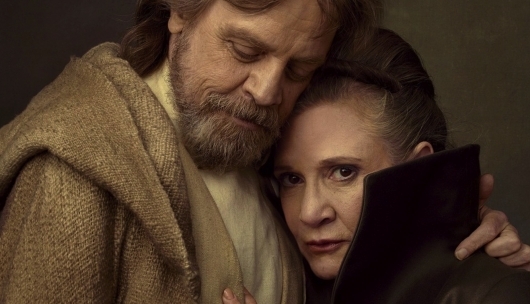 As a part of their coverage on Star Wars: The Last Jedi, Vanity Fair talked to Kennedy about the late Carrie Fisher’s passing, the future of the franchise, and if they will continue the saga beyond Episode IX. More on all of that below. Director Rian Johnson is currently putting the finishing touches on Star Wars: The Last Jedi. And while we still have months before the film hits theaters, we’ve only seen one trailer and a few screen grabs. However, yesterday’s Vanity Fair covers gave us hope that we would learn more about the film, its new characters, and where the franchise goes from here since Carrie Fisher‘s passing. 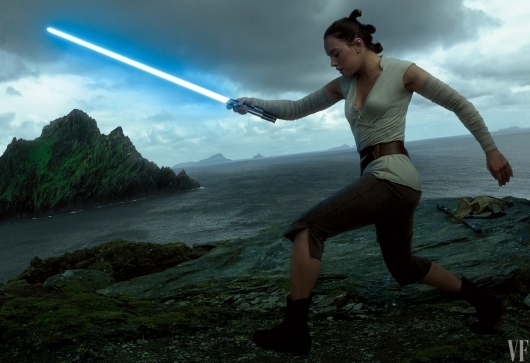 Now not only did the publication deliver on releasing images taken by the great Annie Leibovitz, but new plot details have been revealed that reveal Rey (Daisy Ridley) will be pushed to her limits, Finn (John Boyega) and Rose (Kelly Marie Tran) will go on a secret mission, and how the new characters played by Laura Dern and Benicio Del Toro will play a role in the highly anticipated sequel. Check it out below. When Vanity Fair images for Star Wars: The Force Awakens started coming out, it was our first good look at the film which no one really knew about. That tradition continues with Star Wars: The Last Jedi. Four new Vanity Fair covers have just been released. While we still know next to nothing about the plot of the film, these covers may give us an idea of what to expect. Check it out below.